There is one time in a year when going all out in RED is not overkill. That time of the year is Chinese New Year when anything red is auspicious – yay! 😀 Its also Valentine’s Day this year so red will be in abundance too. I do handle red outfits well if I might say so myself but I also realize that not everyone wants to go full in-your-face red. I sometimes don’t either. So, what I do when I dress a cool black or in neutral sombre colours, is to use red accessories to prevent my relatives shooting dagger looks at me. Red handbags, clutches or wallets are always useful. They add a pop of colour to an otherwise dark outfit, and it is unexpected yet makes a statement. These come under the Vernis collection of Louis Vuitton. I used to be a bit meh about Vernis leather in bags – too shiny and bling bling – but now that I know I can get it in smaller accessories, suddenly, it doesn’t look all that meh anymore. That pop of colour and shine in a small accessory looks promising. I happen to love how the Brea PM (the bag) looks in person. I wore black the day I tried it on and it looked so amazing! BUT I found it too small and a tad dressy for my daily needs. Sigh…. What’s your favourite red accessory? For now, its my red leather bag pictured above that I pull out on days when I feel a little down. Cheers me up aplenty! NEXT POST: Beautilicious Cosmetics Magic Spell Auto Eyeliner puts me under a spell! I love red!! 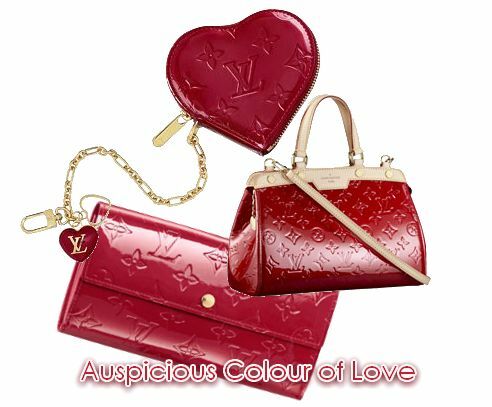 But the mother thinks that red shoes are a little unorthodox in the matchy-matchy department so she forbids me to buy them… Haih… As for the LV Vernis collection, they’re really pretty!! But LV tends to get over-copied by those designer pirates in the mainland, don’t you think? However, I rarely go into designer outlets…. Scared of them, actually…. Sigh…the LV vernis collection is awesome! I absolutely love love love red. Surprisingly though I have hardly any red accessories. I guess my only red “accessory” would be lipstick and underwear! That’s a chic look Nikki! Black and red is an amazing combination. I love LV’s Vernis range but I find their reds a bit too loud. They are still beautiful though 🙂 I have a Vernis Koala wallet in the aubergine shade and at first, was worried to death it will end up scratchy and tattered. But the Vernis range is a lot hardier than they look and my wallet is still scratch free and as good as new after 2 years of use. This being something I chuck into my handbag on a daily basis too. My friends and relatives who own items from Vernis have not faced any problems. If you find something you really like from LV’s Vernis, I’d say go for it! i love the shoe you got! such a lovely pair! my parents don’t allow me to wear only a small touch of red, my clothes MUST be either pink/ red/ yellow/ orange those very chinese-y colours. no neutral or dark at all. sigh, so un-flexible. I dyed my hair red. Hahahhaa….I love my shiny PVC red shoes too. Its awesome to jazz up simple outfits. Currently love my red belt as well. how much is the LV? You’ve got lovely red accessories, Paris 🙂 And yup, I saw the red LV Vernis leather coin purse in China (knock-offs!) sometime in June 2009 and wanted to get it for myself.